Palestinian Arabs in Gaza and elsewhere openly celebrated the massacre of Jewish worshippers at a synagogue in Jerusalem Tuesday morning. Hamas hailed the attack as "revenge" for the death of an Arab bus driver in Jerusalem a day earlier, a death that was ultimately determined to be a suicide. 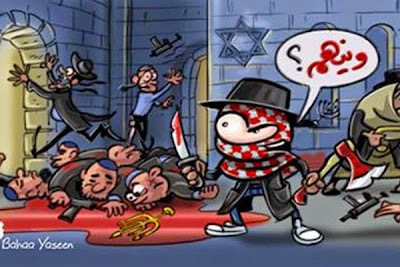 Hamas official Mushir al-Masri even managed to commission or otherwise obtain a grotesque political cartoon (below) praising the "heroic" synagogue attack, which he promptly posted on Twitter. Hamas' sister organization, Islamic Jihad, said that it, too, "salutes the operation in Jerusalem which is a natural response to the crimes of the occupier." For his part, Palestinian Authority leader Mahmoud Abbas issued a statement firmly condemning the murder of Jewish worshippers in their place of prayer. But Israeli officials suggested that Abbas was shedding crocodile tears, and insisted that it was ongoing anti-Jewish incitement in Abbas' own state-controlled media that sets the stage for such atrocities. "This is the direct result of the incitement led by Hamas and Abu Mazen [Abbas], incitement that the international community irresponsibly ignores," read a statement issued by Prime Minister Benjamin Netanyahu. Foreign Minister Avigdor Lieberman added, "It is incumbent upon the international community to condemn Abbas' anti-Semitic remarks, which lead to massacres such as what has taken place this morning." Indeed, just last week, Palestinian Authority TV, which is directly controlled by the Abbas regime, aired a documentary on the history of the Palestinian leader's Fatah movement in which the Jews were presented as a foreign contaminate that were put in this land by European powers that had grown tired of their problematic Jewish populations. In a related development, it was reported that the perpetrators of Tuesday's synagogue attack were relatives of one of the 1,027 terrorists Israel released in 2011 in exchange for abducted Israeli soldier Gilad Shalit. That revelation further bolstered arguments that the "goodwill gesture" of freeing jailed terrorists does absolutely nothing to soften Palestinian views of Israel or advance the cause of peace.